Okay. . .finally a non-flower card! 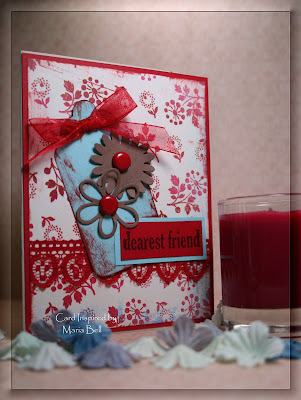 Everything about this card was made use scrap pieces from my scrap pile. 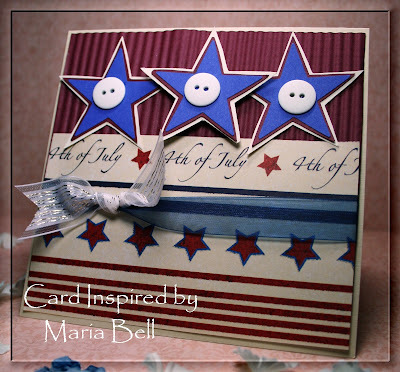 Don't forget to scroll down and check out the other 3 cards I made today. I'm really on the roll today! Lately, I've been feeling so "blah" and it feels so wonderful to be able to make more than one card. . .especially cards made with my scraps! Not to change the subject but . . .if you've been reading my blogs for a while now, you'll know that I love indie films! Anybody watch "Lars and the Real Girls"? I really thought this was a suprisingly good movie. This movie is a trip because Lars, the main character, had a relationship with a blown up girl. Okay, it's not what it sounds like. . .it's actually a very touching film. The underlying message that I got from this movie was how a community can help heal a person who may have a mental problem by just truly caring for the person and ignoring the quirkiness or strangre behavior that the person may be exhibiting. If you can get past that and truly help the individual by being supportive, you can actually heal the person. Anyway, if you haven't seen that film . .I do highly recommend it. Another film I do recommend is "There Will Be Blood". It was a very interesting movie. Did any of you see it? Wow, Daniel Day Lewis was REALLY good in this movie. It's no wonder he won the Oscar for this movie. "There Will Be Blood" was far better, in my opinion, than "No Country for Old Men" and I don't understand why "No Country" won for best picture. I didn't like that movie. It was boring in my opinion. It was slow and I just didn't think it would be a movie I would consider for best picture. Oh. . .did anyone watch "the Diving Bell and the Butterfly"? Argghhh. . .the movie disturbed me. I can't imagine living the life of the main character. It's a nightmarish thought. See the movie and you'll understand what I'm talking about. The movie is a bit slow . . .just to let you know. Whoohoo! Another card! Wow, this one was quick! This one was a 15 minute card! I just love it when everything comes together so quickly! Are you getting tired of the flowers? Yeah, me too! My next card won't be a card with a flower design. 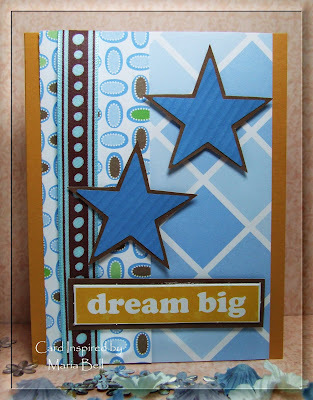 All the designer papers on this card are from my scrap pile! I'm on the roll today! Okay. . .if you subscribe to my blog and receive updates when ever I post, well. . .you may be annoyed that you'll have a lot of posts today. Sorry about that! I usually receive one post a day from Feedblitz . . .it spools all of my post and sends one update a day. I subscribe to my own blog! LOL! I subscribe to it so I know when there's a problem with Feedblitz. I received an email from a subscriber that told me that she has been receiving 4 to 5 updates a day from my blog but I, typically, post only once a day so I'm not sure why she received more than one update. Today will be an exception because I'm planning to post my cards as I finish them. If you are a subscriber to my blog, do you receive more than one update from Feedblitz on a daily basis? If you are. . .I'm not sure why because I usually don't post more than once a day and if I do, I usually receive only one email notice for all my posts. Can you let me know if you are receiving more than one update a day from my blog site? I would hate to irritate you will all my updates! LOL! On to my next card! Until later!! Hi Everyone! Here's a random card I made. What I did was close my eyes and pulled a bunch of designer paper from my scrap pile and I HAD to use one of the papers that I pulled out. I play these silly games because otherwise, I'll get all picky and choosy and not use my scraps. Only the papers and cardstocks are scraps. . .the ribbon, sentiment, and button are not from my scrap pile. 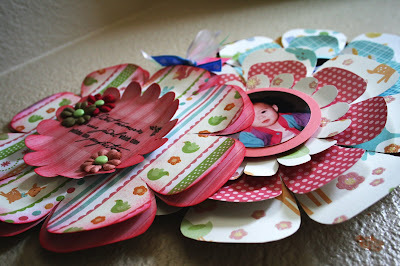 None of my embellishments from my scrap pile matched the colors of my cardstock and designer paper. Do you see the punched border? Well, I had not used my border punch for ages and I mean, ages so I decided to use it and I'm glad I did. How are you doing reducing your scrap pile? My scrap pile actually grew larger! Arggghhh! I made all those goody box purses and well, the remnants were added to my pile. I just can't get away from it. I have an interesting story to tell you all. Yesterday I had called a hospital and spoke to the person that heads the volunteer department. I had told her that I make handmade cards and would like to donate a bunch of cards, maybe once a month, to give to patients and was wondering if they had a program that handles donations. The lady stated that there was no current programs that accepts handmade cards. I told her "well, it don't have to be a program but would they be willing to accept my cards and give them to the patients". She then said "well, we don't have the people to pass them out". I said "well, maybe the cards can be left at the nurses station and when the patient receives their food tray in the morning or during lunch, the nurse could place the card on the tray". Okay. . .this lady was not receptive at all. She said "the nurses don't have the time to do that. . .they are too busy! and no one has the time to fill out the cards!" I explained that I could write a simple note on each card and all the nurse has to do is give it to the patient!" Nope! The lady was not open to that idea. Sheesh! What a road block! Okay. . .I'm an RN, I've worked in a much busier hospital than the little hospital in my town. . .I know what a nurse can or cannot do and they HAVE the time to hand a patient a card!!!! Gosh, I got such a cold response. . .brrrrrrrrrrrrrr! It sure was chilly having a conversation with this volunteer department! The conversation ended with her saying "no, we just don't do that kind of stuff"!! Well, I was really put off. Don't think that this was the only hospital that responded the same way. I actually called three hospitals and all of them sort of "shut me down cold"! LOL! I'm a little shocked by it. I even suggested that I would personally drop the cards off at the nurses station on each unit and they weren't receptive at all. I decided to call their administrative office rather than talk to the volunteer department. The administrative office was more receptive to the idea and directed me to some one else who could help maybe make it happen. I called the lady but she wasn't in so I'll try again on Monday. We'll see what happens!! Anyway, that's my story for the day!! Hope y'all have a wonderful day! Hi Everyone! I'm sorry I've been MIA for the past few days! I've been setting up my new photo blog site "Photo Inspirations". . .okay, the name isn't very original but I sort of have a theme going. . . .you know, with the word "inspired" and "inspirations". The link is located also at the top of my blog. You're like, "oh, gawd. . .what now, Maria". . ."another blog?". Yeah, I'm the sort of person that likes to compartmentalize things. I do this so I can remain focused. Anyway, Photo Inspirations is where I'm going to post my photos. . .not just ordinary "family oriented" type of photos. . .I like to call them "art photos". I like to journal via my blogs my progress, especially when I'm learning something new. Right now I'm learning to take better photos and learn to use Photoshop. I'm planning to post tutorials on Photoshop editing and camera features as I learn them. I need to create these tutorials so I can have a reference for myself as well as share with others. If you have Photoshop or an dSLR camera and want to learn as I go through my own learning experience, stop by and see what is going on. If you are an expert in these areas. . .hey, email me or comment my blog . . .I'd love to receive input. . .I'm totally clueless, so any input are welcome. Anyway, when you have the time, stop by my photo blog and see what I'm doing. 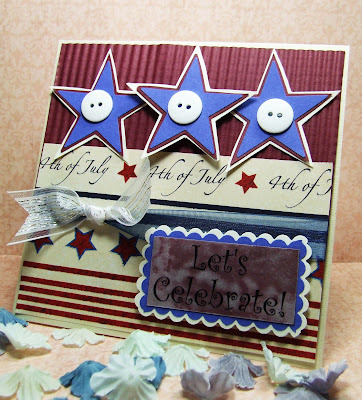 Don't forget to stop by Stampin Inspirations. . .I posted a bunch of goody boxes that I created for the Key Club. Check out how many I made. . .whew, I can't believe I made that many boxes in a matter of a day or two. I'll post a card on this blog site tomorrow. I just didn't have the time to post the card I made today. . .it's time for me to go to bed. Have you ever wanted to add side by side photos to your blog? As you can see with the photos above. . .the pictures are side by side as opposed to being tiered down (one picture higher than the other). This is a great way to show "before" and "after" pictures or contrasting photos like I did above. In my photos above, I was playing with Photoshop again. My original photo was blurry and I felt that if I reduced the saturation, the photo can be salvagable. I wanted to show the contrasting difference between the two photo. It's much easier to see the differences of the two photos if they were side by side so I went hunting for tutorial that will help me do this. Click here for the tutorial. You will need to scroll down to the section that says "Making a table so photos are side by side". I'm not a super computer savy person and I was able to follow the tutorial so try it out and see if it works for you. Hi Everyone!! Okay. . .I'm trying to learn a few "basic" Photoshop features. One of them was to blur my background and keeping my foreground sharp. When I took the picture with my Canon Rebel XTi. . .my intention was to have the background blurred but it didn't turn out that way. I found a website that gave a good tutorial. . .well, what I mean by good is "easy". 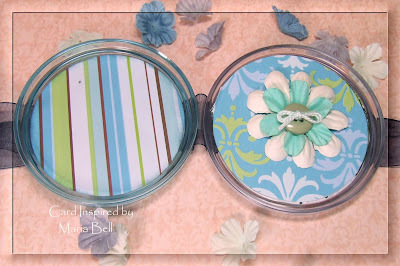 I tried 4 different tutorials and this one was the EASIEST!! Gawd, the others were like . . .so complicated, being a newbie with Photoshop, I was sooooo confused. Anyway, this isn't the best photo but I chose this photo of my daughter randomly to "play" with. As you can see. . .the background of the picture above is sharp. Here is the same photo with the background slightly blurred. I didn't want to over blur the background because the picture of my daughter will look like she was pasted on to the picture. I also found a way to SUPER enlarge your photo on Blogger without distorting the photo and compromising the quality of your photo. If you drag the corners to enlarge your photo, well, the pixel on your photo will start to show and the quality become distorted. 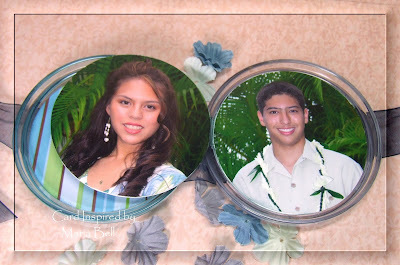 With this tutorial, you can have an enlarged photo on your blog that is larger than the max size that Blogger provides. I wanted to show the background so you can see it but when I originally uploaded on to my blog, the largest size allowed was too small and it didn't show the background as well as I wanted it to. I dragged corners to enlarge it but the quality became distorted and the tutorial I provided allowed me to enlarge the photo and still maintain it's quality. Hi Everyone! Howz your Sunday going? Hope y'all are having fun! We went to one of the Temecula winery today to eat lunch. Yummy! I took a lot of pictures but I didn't want to post them here on my card blog site. I'm thinking of creating another blog site for my photos. 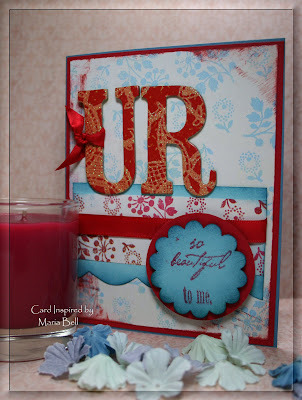 I know that many of you who visit my blog site want card ideas and don't care to see my photos. Nonetheless, I've been having a blast using my Canon Rebel. I'm a serious amateur when it comes to photography and I wish I could take all the spectacular photos that I see using this awesome camera. Anyway. . .another thing I'm an amateur with is using Photoshop. I mean, seriously clueless. I just don't have the time to read and learn how to use it but that doesn't mean I can't play around with it. I created this collage of my daughter using photos that I took today at the winery. Okay, I really didn't know what I was doing but I managed to create the collage above by just clicking on buttons not knowing what they were. LOL!! Considering I was clueless, I like how it came out. What do you think? Do you see the bee inside the flower? My daughter took this picture using my Canon Rebel XTi. This photo is totally unedited. It was taken on auto focus/macro. Isn't it pretty. I took more photos of the bees in other flowers which I'll post on another day. I'll also post a few photos of the winery . . .maybe tomorrow. Just a card I made using scraps again. 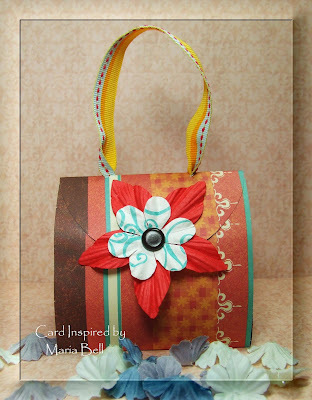 I made the purse that I posted yesterday using the designer paper on this card and I just wanted to waste it. I'm getting tired of looking at all my scraps. It annoys me to look at them and sometimes to even use them because I have so many of them that it's overwhelming. 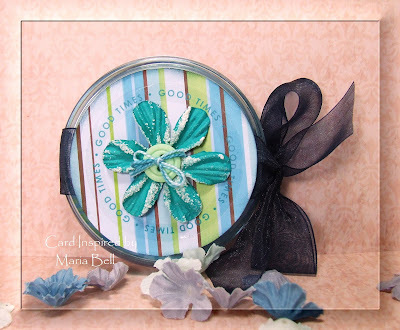 The DP is by K&Co, the daisy ribbon is by Making Memories, the large prima flower is by Target, the smaller prima by I believe Darice. . .not sure, the sentiment tags are by K&Co. 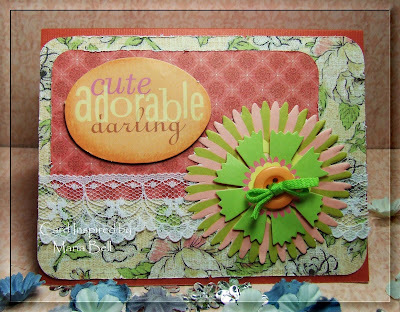 Another card using up scrap pieces. Arggghhh! The scrap pieces are never ending. What do you folks do with your scrap pieces? Do you folks use them or do you just continue to accumulate them? I don't like wasting them so I try to use them on a regular basis but it also means I can't move on to use any new papers and embellishments because I'm sort of stuck trying to reduce my scrap pile. They are all pretty scraps but I like my new stuff too and I would love to use them. Anyway. . .I know. . .I'm complaining again. Whaa, whaa, whaa! LOL! Well, hope y'all have a wonderful Memorial Day tomorrow!! We don't have major plans. . .just BBQing in our backyard. Hi Everyone! Sheesh, I haven't posted for a few days because my allergies have been driving me crazy. I can't even tell if I have allergies or a cold. . .they feel the same to me. It's really hard to craft when everything feels fuzzy. Argggh! Anyway. . .I feel better today so I decided to make something. On Wednesday, it was my son's Senior Awards night and he was recognized along with other students for their effort in community service. Wow, the kids are sooooooo impressive. Throughout my kid's high school years, we emphasized the importance of community service and you know, as much as they give back to the community, they tell me that they feel really good about doing what they do and that is what is important. My son is pictured with my daughter's best friend who is graduating this year. My daughter is still a junior but her friend will be leaving for UC Berkely in the fall. Wow, she is quite an impressive girl. She received several awards on Wednesday. She complimented my daughter in that she encouraged my daughter to achieve academic excellence and my daughter complimented her by encouraging her to participate in community service. What a fabulous combination, don't you think? Anyway, I decided to make a card and a small goody bag to give to my daughter's best friend. It'll be a little sad for my daughter because both her brother and her best friend will be in college while she will still be in high school. I hope she'll cope and find a friend that will be as good as her best friend (I don't want to say her name because well, I didn't obtain permission to post her picture). I know the card and purse is a bit busy but teenagers like bright funky colors anyway. 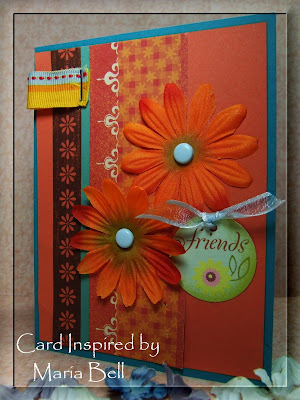 Here is the card. . .it's sort of hodge-podge but I thought it was a fun combination of colors. 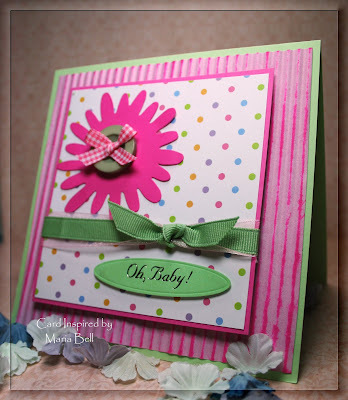 The designer paper is a scrap piece that I used to inspire all the colors of my card. The paper is by K&CO. 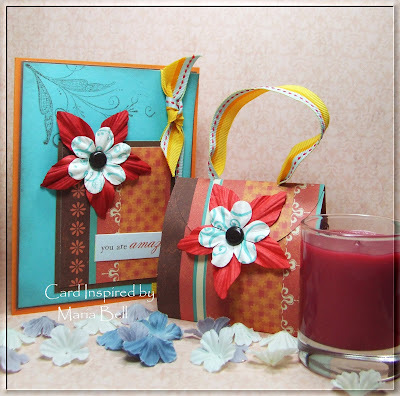 The ribbon is by Basic Grey and flowers are by Dejaview. 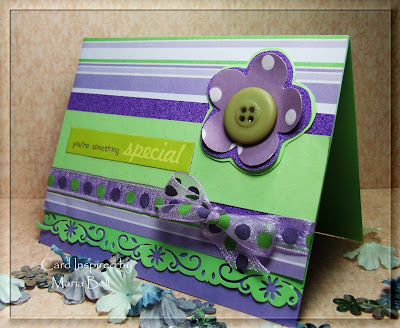 The stamped background is a stamp from Heidi Grace and the sentiment is by K&Co. Here is the mini purse that I stuffed with candy. Just a small goody bad. Teens love chocolate so I thought it was appropriate to stuff it with candy. LOL! 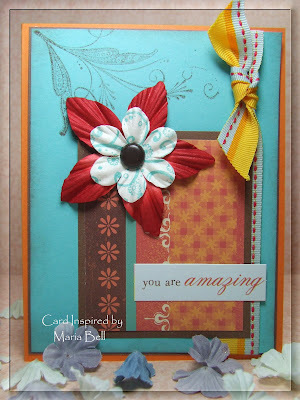 Here is a close up of the Prima flowers that I layered. I love layering embellishments. . .they look better in my opinion when they are layered and dressed up a bit. This is the original template. I saved the template on to my computer but then I forgot to note the website that I got it from. The template is by Kathleen McKinney but I can't remember if I got it from a blog site or a website. If you know Kathleen McKinney's site's address, can someone send me the link so I can add her site's link. If you decide to use this template, when you print it. . .it may be a little large so you will need to set your printer to the setting "fit to page" or "copy" the image and paste it on to your publishing program and modify the size. 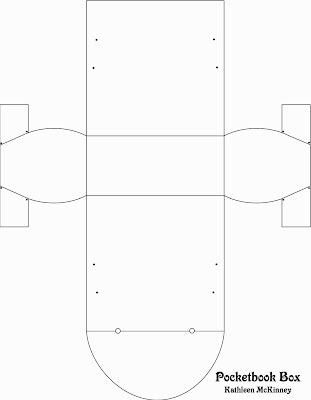 Here is the template without all the marking so you can print it directly on to your designer paper or cardstock so you don't have to cut it out and trace it. It's much easier and faster to print it directly on to your cardstock. You then use the original template as a reference to score and fold the purse. Click on the image and it will enlarge. It may look REALLY large but when you print it will adjust automatically and print to fit on a 8 1/2 x 11" cardstock. If it doesn't adjust and print on to an 8 1/2 x 11" cardstock, you may need to set your printer to "fit to page". The final size of the purse is approximately 3 1/4" squared. Hope y'all have a wonderful Memorial Day weekend. Hi Everyone! Well, I resolved the issue that I had with my daughter's AP Calculus teacher. Her teacher reassured me that she won't fail the class and that she can bomb everything from this point on and still pass the class. Okay. . .well, that was interesting. I'm not sure where that came from. I had spoken to my daughter's counselor earlier in the morning and asked that we meet along with the academic advisor who heads the AP calculus department (meaning the vice principal) as well as the teacher. She sent an email to the teacher with an interesting note. . .stating that my concerns may require additional "action" and that a meeting with the academic advisor may need to be initiated. I think that was subliminal note to the teacher, if you know what I mean. A few hours later I got the call from my daughter's teacher. My daughter's teacher said that my daughter had approached him today and asked that her test be reviewed and that she felt she deserved "credit" for parts of the tests and explained that her tutors felt that he was grading the tests too harshly. He then told me that if a student feels strongly enough to approach him for a review, he was willing to re-evaluate her work and he agreed to give her "back" a few points. Whoohoo! I'm not sure if it was the email from the counselor or my daughter approaching him that prompted him to call me and consider re-evaluating her work. Okay. . .I feel a little better. All my daughter needs to do now is work on getting a B. AP classes are colleges courses that totals a 5.0 rather than a 4.0 so a B is equivalent to an "A" grade. Maybe, just maybe, she can bring her grade up. Anyway. . .I'm happy again. Whew! I'm so glad I got that issue resolved. I hate meeting with teachers and such. They get so defensive. Well this is a mini album I created a while back. 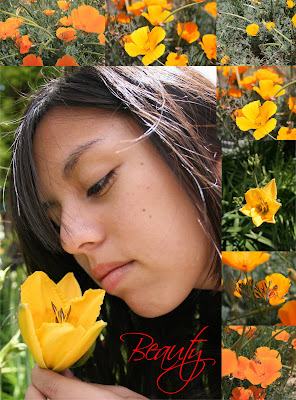 Initially, I created the flower pages but wasn't sure what I was going to do with them. I was thinking of attaching them to a cork board and hanging them on the wall but decided to create a mini album instead. I had posted the pictures of the pages individually on a previous post. The post also includes the template for the flower pages if you are interested in creating this mini album: Click Here for the post and the template. Hi Everyone! Last night we attended the college scholarship award ceremony for our school district. My son was invited and he was awarded a scholarship for college. 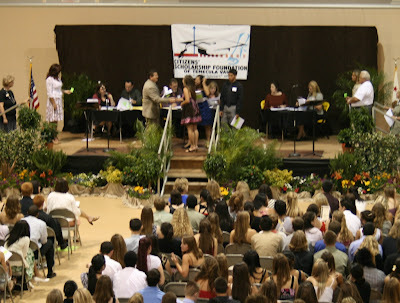 There were 250 students awarded and my son was one of them. Yay!! That's not bad considering our district has close to 2,000 seniors graduating this year. Oh, gosh. . .we were at the ceremony for 3 hours. We didn't get home until close to 11. 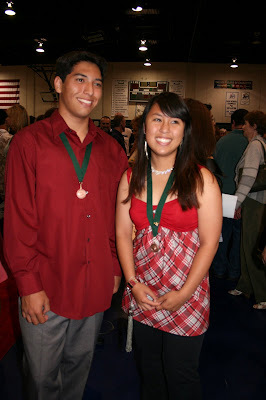 There were a few that were awarded multiple scholarships but my son only received one. That's good enough in my opinion. With the economy the way it is. . .well, any award will help!! I have a dilemma. . .my daughter is taking a college level Calculus class as a junior in high school but she has a low C right now and could quite easily fail the class. She's had a tutor for the last two months to help her but it doesn't seem to be working. 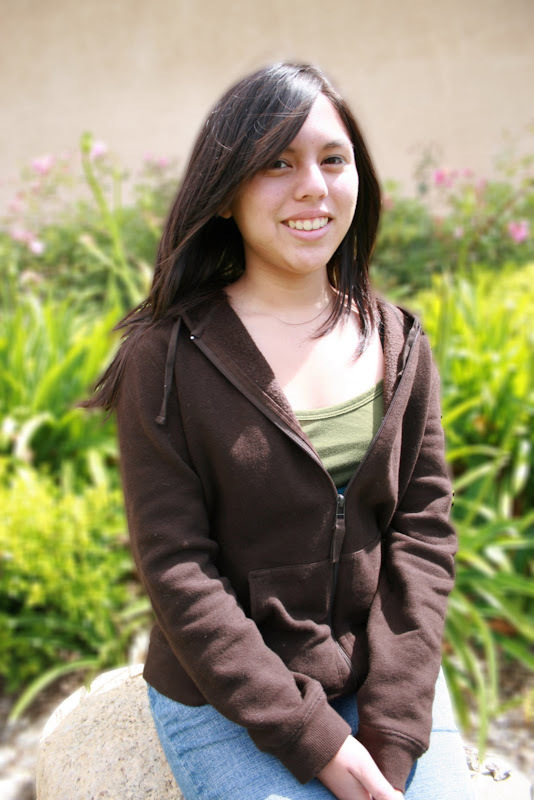 She's gone through two professional tutors and both felt that her tests are being graded quite harshly even at a college level. I'm soooooooo upset because my daughter is an A student and have always done well in school. With college being so competitive, even a single C in a AP Calculus class is enough for a college of her choice to reject her application. She was at the top 5% of her class and she's now top 10 but the low grade in Calculus will maybe push her out of the top 10%. Many of the top colleges look at the ranking. It upsets me because she could have taken a lower level math like high school Calculus and would have gotten an A and her standing would have increased or at least remained the same. Instead she was encouraged to take the college Calculus by the same math teacher. Her tutors had told me that she understands the concepts and should be graded higher. I talked to her counselor today and in the middle of my conversation with her I started to cry. I didn't want to do that but I couldn't help myself. I just feel that my daughter has worked so hard to get to this point and to have one class adversely effect her college goals is so upsetting. It has effected my daughter's self esteem and it makes me feel bad. She has always prided herself in doing so well in school and she is sort of feeling bad about her terrible math grade. Anyway, I'll be meeting with her teacher. . .we'll see how it goes. As for my cards. . .just a bunch of July 4th cards. This card to the right is a card that I had posted yesterday (scroll down to yesterday's post) and I didn't like the way the sentiment looked so I removed it. I think it looks better now. Anyway, I need to de-stress. . .I'll see if making cards today will make me feel better. Hi Everyone! Hope y'all are having a wonderful afternoon! This is a picture of my dog Dakota. He is a really sneaky dog. . .very smart but very sneaky and sort of conniving. Here he is chewing up his toy. . .he removed the stuffing from it when he thought no one was looking. . . 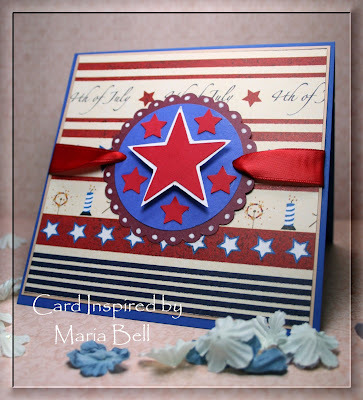 Anyway. . .just a July 4th card I made today. The sentiment "Let's Celebrate" sort of got messed up because I had stuck the velum sentiment on to a dark cardstock and it didn't show up too well. It also has that splotchy look to it but I actually kinda like it. In person, it sort of has a marbled look to it. In the picture. . .well, it didn't translate as well! I don't know. . .I think I'm going to remove it. Yeah, after looking at it. . .I think I will. Ya' know. . .I've been banned from buying any more craft stuff. My husband said that my spending on craft stuff is getting a bit ridiculous. I know, I know. He said that if I want to buy more stuff, I have to use my own money. Okay. . .now that's a joke because I don't have a real job. LOL! I didn't argue with him because he is right. I have enough stuff to stock a store. LMAO!! Seriously. . .so, I agreed. Let's see if I can do it. . . .you know, not buy anything for at least 6 months. Yeah, right. Okay. . .that'll be my goal. I will use what I have, be satisfied with what I have, and stop buying stuff that I can't or don't have time to readily use. You know. . .I'll buy stuff. . .then it sort of goes into a bin and by the time I use it. . .it's like out-dated! Too funny. . .then, because they're out-dated designs, I'll go to the store and buy more current stuff and it sort of goes in a circle. So lame of me. . .but I wasn't upset when I was banned from spending. . .I know he is right and that I buy just to buy. . .you know, just because. Is there a scrapaholic or stampaholic anonymous? I wonder. . ..I think I may have to join!! Hi Everyone!! My kids volunteered for the Key Club this weekend. My daughter will be the president of the club next year and she's currently the treasurer and my son currently is the vice president. They helped out the Temecula community auction that was held this weekend at our community arts theater to help raise funds for the community choir group. 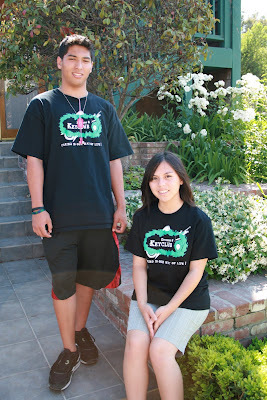 My daughter designed the Riverside County District Key Club t-shirt this year and they are pictured with the T-shirt. My daughter has over 150 volunteer hours under her belt and my son just met the 100 mark. Whoohoo! They volunteer for the community on weekends for many charitable events, community services, etc. I'm so proud of their accomplishments!! Just a simple card for today. This card is what I call slap it on card meaning slap whatever that fits. LOL! I used the SU crimper to create the crimped background and rubbed an ink pad over it. Simple. I'm really not feeling the flower but it's a scrap piece that I had so I had to use it. Nothing much else to the card. I don't know the brands of the materials that I used because all of the pieces were scrap pieces. I believe the polka dot DP is by DCWV but I'm not sure. I know the flower is a die cut by Sizzix. Hope y'all have a wonderful Monday!! Hey Everyone! I'm back! Wow, I spent the past few days cleaning out my computer. I had sooooooo many photos on my computer that they were slowing down my computer. I transferred a couple hundred of them on to disks. My computer now loads my photos from my camera really fast. Yay! I want to show off my photos from my new camera. My husband bought me a Canon Rebel Xti. OMG!!!!! I LOVE, LOVE, LOVE my camera. Okay, I found a new hobby! The picture above is the very first photo I took with the camera. It's a picture of my buddy Dori! I love her like she was one of my kids. Doesn't she look adorable? Okay, I'm a complete amateur photographer. I mean, I'm an "auto focus" shooter. . .you know what I mean. The Rebel is a digital SLR and I would love to use the camera the way it should be used. I think I have to take a photography class to learn how to use an SLR. BUT. . .wow, check out the photos of flowers I took. All on auto and absolutely no editing. I mean on auto, it looks like I took the picture like a pro. I am sooooooo impressed by the photos. I mean it's so nice and clear and the colors are so accurate. I can't believe I took these photos. Aren't they beautiful? The flowers are from my yard. 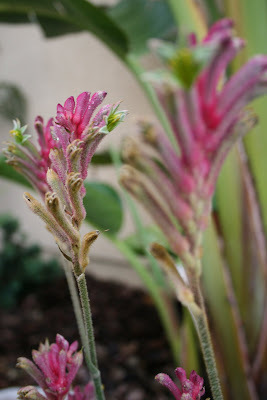 Scroll down and check out the other photos of flowers that I took. Click on the picture and you can see an enlarged version of the photos and you'll see how sharp they turned out. I took this photo at the auto focus - macro setting. AWESOME!! I love how the center looks so sharp and the rest of the photo is slightly blurred. Here is another photo of a flower from my yard! Again, I took the photo on "auto focus" and "macro". I took so many AWESOME photos and would love to post them all but I don't want to bore you with all my photos. I think I'm going to start a new blog just for my photos. What do you think? Anyway, scroll down to view two cards I made last night. I made this card using scrap pieces, again. Just getting rid of my scraps. Just another using the same designer paper. Again, I used scrap pieces from my scrap pile. Hi Everybody! Sorry I've been MIA for the past few days! I'll be back in a few days! I've been busy. . .arrrgh! Things should slow down in a day or so and I can return to my old crafting self!! 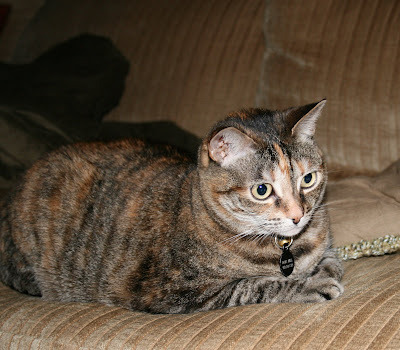 Sorry I've been absent on visiting your blogs too! Hope everyone is having a wonderful week!! Until later!!! Hi Everyone! Yes, you saw correctly. . .it's a Tupperware coaster album. I stopped by my local Goodwill the other day and I found two sets of 6 Tupperware coasters that were brand new. Initially, I didn't know they were Tupperware until I opened the sealed box which wasn't labeled. Each of the box were 50 cents each. Whoohoo!! Anyway, I knew they were plastic coasters and bought them for the purpose of altering them into something but didn't know what! LOL! Well, after looking at it, I decided to create a mini album with two of the coasters and I really like how it turned out. I think it looks better in person. Here are samples of the coasters. 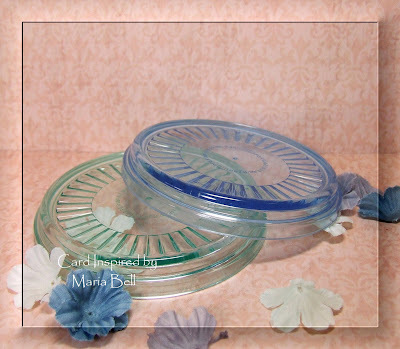 Initially, I was thinking of adding photos to the back of the coaster and use them as actual coasters but I noticed the "tupperware" label in the center and I didn't like the idea that it would show in front of the photo so I decided to cover it with a designer paper. Oh well. 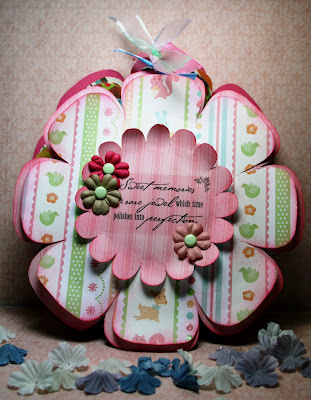 I covered the inside with designer paper from ADT and added CTMH Big Blooms and Deja View prima flowers. 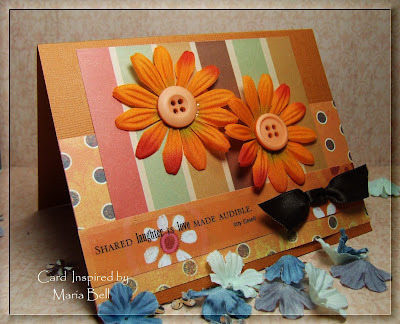 The mini album is a flip page album which I created using cardstock. I cut the cardstock to create initially an accordion album then glued the back side together to create a "flip" album meaning it flips open from right to left like a regular album. Theres a total of 7 pages to this album. The photos are of my kids.